Instructors and practitioners from different martial arts attended the International Kerambit Seminar, November 2007, hosted by Carlo Andreis in Desenzano Del Garda, Italy. The seminar covered entries, release counters and take-downs in regards to the Kerambit. I would like to express my deepest appreciation to everyone who participated in the seminar and those who helped me in the instruction and demonstration. This seminar, like all my other seminars aims to raise curiosity and awareness among people of different nationalities about the martial heritage and culture of Brunei Darussalam and silat in general. The understanding that what makes a martial art is the culture from which it comes from and not generalizing it simply as all silat being the same. Please enjoy the Video above. In regards to this article, please bear in mind I am only describing its details it in terms of my understanding of my culture and martial training. It may or may not reflect the views of other silat styles and southeast asian martial arts in general. It is not my intention to say how your system use it is wrong. Please keep in mind there are thousands of silat and martial art styles in Southeast asia. What is the reason for these many styles if all views and movements are the same? The Kerambit (a.k.a, karambit, korambit) is a very sharp small hooked knife with a ring on its handle. Its traditionally a close quarter, stealth weapon found in Silat. No matter how a person tries to convince you that the kerambit is an agricultural or D.I.Y tool you cant help but feel and see that its design and function is more for killing then anything else. Based on the design of a tigers claw, a competent practitioner don't just cut any part of the body but aims for the arteries and soft tissues of the body. 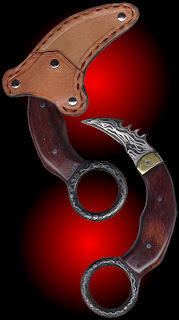 The kerambit cuts and slices, but its design functions more for tearing and piercing, to inflict maximum damage. + an assassination weapon, where the metal is forged in poison or dipped in poison. Traditional silat kerambit are usually very small, where only a few centimeters of its blade can only be seen from the edge of your hand. The reason for this is for its stealth. In the olden days regardless if you are a man or a woman, rings are worn as a part of a normal garment to events, gatherings or occasions to show status or just a family heirloom past down from parent to child. A tradition still practised in the Malay tradition more by women, where a mother would pass down her jewellery to a daughter that has come to a certain age; usually made of gold, part of a head-dress, necklace, pendant, bracelets or ring. It is through this tradition, that a kerambit is the preferred weapon for women in the old days for self protection, it would be adorn and designed like a normal part of the jewellery; an unsuspecting attacker (or individual with bad intentions) would lay down on the ground bleeding, or worst holding his inside from an opening under his navel, not knowing what had happened. Due to its innocent and unsuspecting nature, it is also one of the favourite weapons of female assassins. They would disguise themselves as dancers or servants to move freely in a private function or party, and when they could get close to the intended target, his/her throat would be slashed or other major arteries ripped open. This type of public killing is usually done to send a message to the intended family or group of people. Depending on the message sent, it could be a fast and violent or a slow and painful death. Not many styles would use this in their repertoire. But some who see the major advantages of it as a secondary weapon understands its lethality in a close-quarter confrontation. Coupled with its hidden-carry attributes, the opponent or attackers wont really know what hit them until its too late. Unlike the 1st example, this method is usually favoured by hired assassins or by those who are not fighters, knowing well enough that their fighting skill are no match for the intended target. All they need is but a scratch or a pin-prick to the artery lines of the body for the poison to spread. This method of killing is usually done so that the intention cannot be traced back to the person that done it. Depending on the poison used, death could be as slow as hours to weeks, giving the killer time to move far away from the victim before he even notices anything is wrong with him. The symptoms might start of with a mere dizziness then escalating to a fever to lost of functions of internal organs, etc. Most times the actual cause of death may not be known by their family member or if they do, its too late to counter the effects of the poison. Today the kerambit is no more a killing tool then a nunchuku used in martial arts exhibition. It is taught in a more stylized way (depending on the instructor teaching) to promote its use in a more cultural way as an entertainment and information on martial heritage of a country. Please do not think that the kerambit is still used the same way today as it was in the old Malay world. Those days are long gone, and most of its knowledge hand been extinct but only to a hand-few. Thanks to the efforts of southeast asian martial arts enthusiast and instructors in the US, like all things, if its cool in the US, its cool with the rest of the world; like Dan Inosanto and his students, the late Herman Suwanda, Leo Gaje Jr, Steve Tarani, Ray Dionaldo, William Sanders, etc, as they have paved the way for other masters from where the art came from to teach and propagate their art and other martial arts practitioners to find thier way to the southeast asian martial arts.